Looks like I haven’t updated with any new jewelry pictures since November. What’s that all about!? Here are things I’ve worked on in the interim. 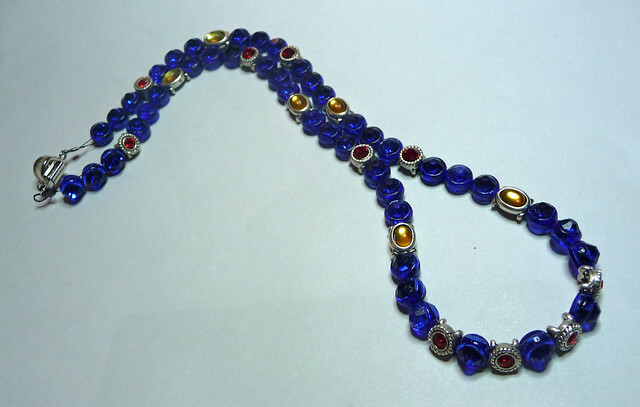 This is a remake of a previous iteration of this necklace. 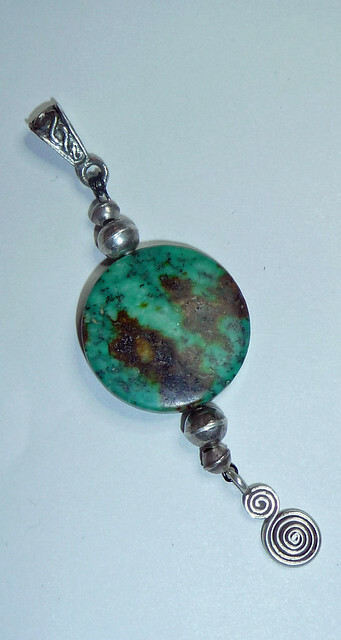 I liked it before, but thought it was too much moss agate. So I ripped it apart, added some silver findings, and slightly shortened its length. 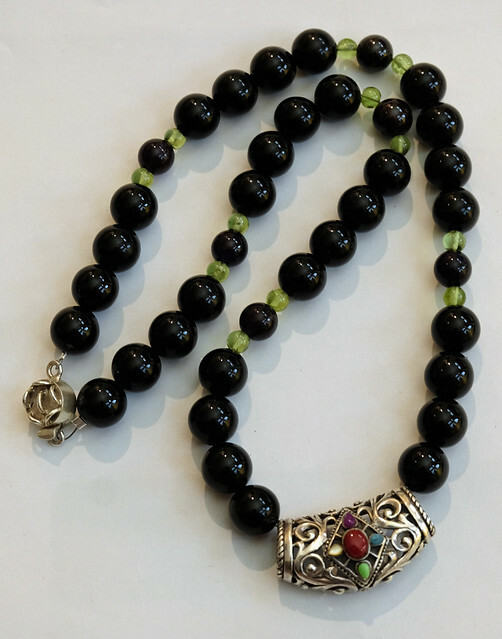 This necklace is primarily onyx, with peridot findings instead of silver. In between the peridot are alternating pieces of garnet and amethyst. 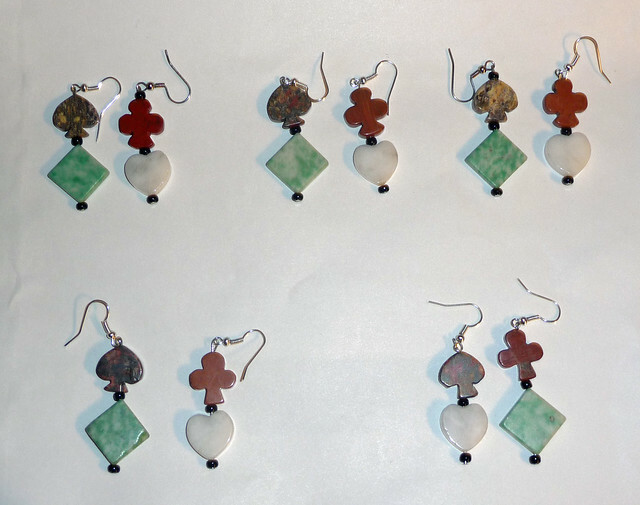 The silver finding has mixed carnelian, turquoise, citrine, amethyst, and peridot bits. This is mostly likely for sale. Not scared of black cats? 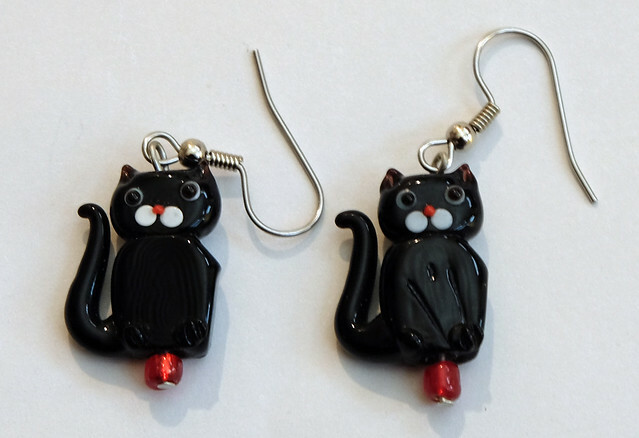 Easy to prove when wearing these black cat earrings with surgical ear hooks. Made for sale. I got a set of stone card suites to use to make BF some wine charms. However, they didn’t work for that. They do make fantastic earrings, however. Made for sale. 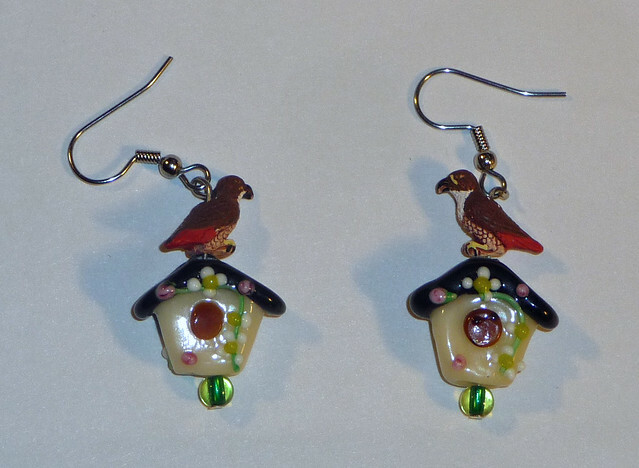 I saw these bird houses at a bead shop in VA and know I had to have them! When I got home, I paired them immediately with my red tail hawks. I made them for sale, but I might end up keeping a set for myself. 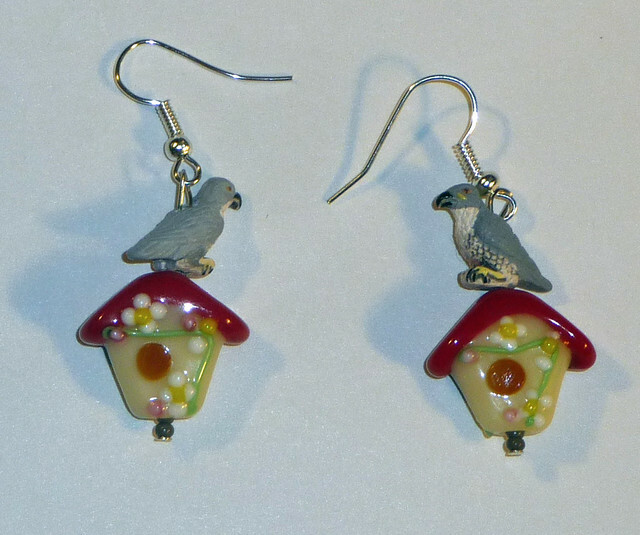 I loved how the above tails came out, so I looked online to find more of the birdhouses. I finally found a place that had the ones I wanted. I thought I was getting a mixed bag of colors, but it turned out I bought 100 red bird houses. 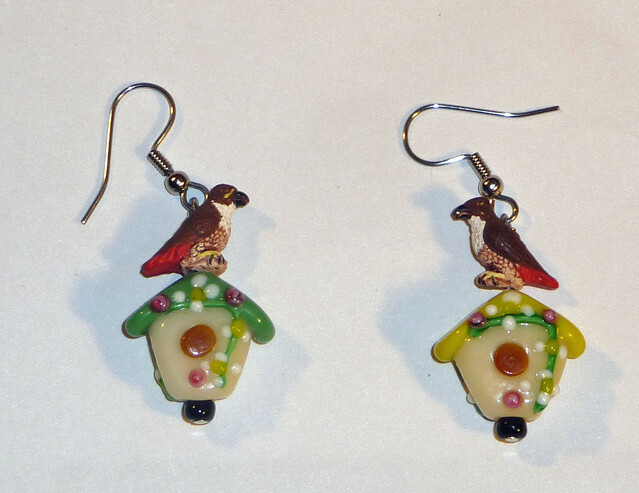 *wry smile* Well, red tops might blend too much with the tails, but they look great with my peregrine falcons. Made for sale. More of them will be made. 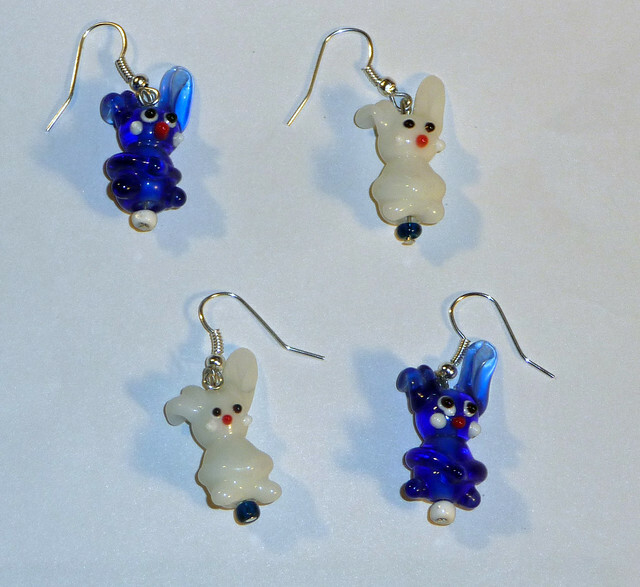 I found some blue and white lamp work bunnies, so I decided to make some earrings with them. So far I’ve made two sets, one in each set with blue bunny and white seed bead and the other with white bunny and blue seed bead. Made for sale. More of them will be made. I made some jewelry for canyonwalker’s side of the family. 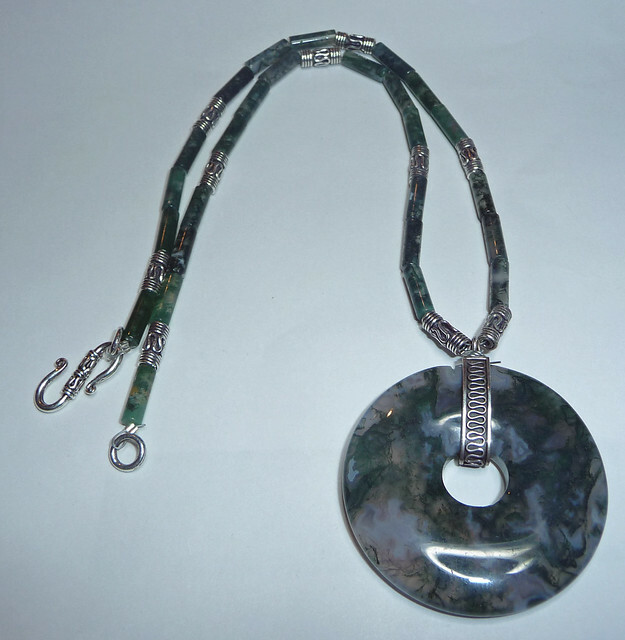 This is a cloisonné blue and purple necklace I made for his mother. I figured she’d wear it to church, and it reminded me of stained glass, which seems like an appropriate theme for something you’d wear to mass. 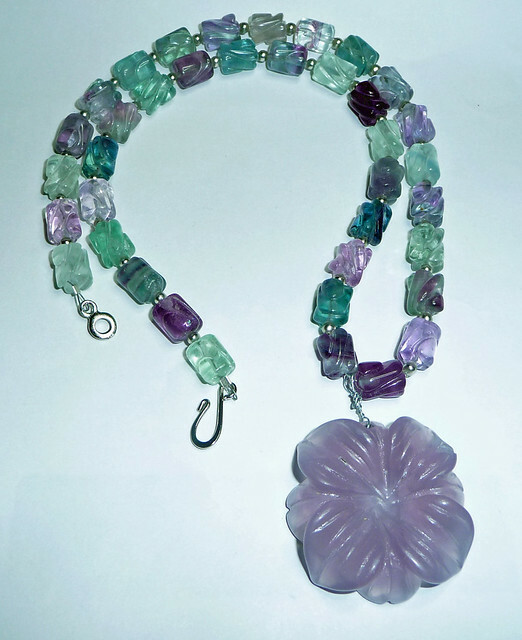 Carved fluorite and quartz flower with silver finding necklace for a SiL. 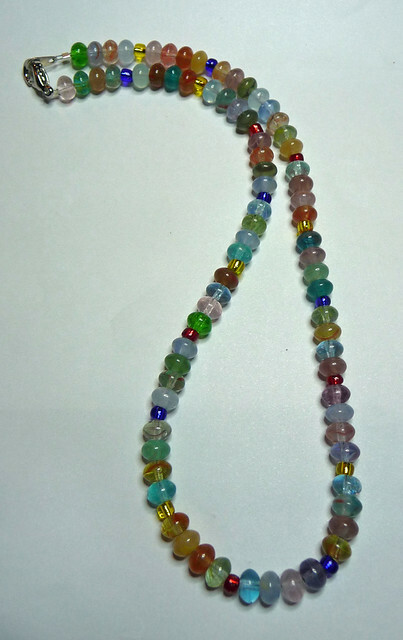 Her favorite colors are all the colors that end up in fluorite, so it was the perfect stone for her. She ended up getting it right before Mother’s Day. All her mom friends were jealous! I got these cut crystal and glass beads from my great-aunt’s estate years ago, and I paired them with some more modern silver and glass beads for one of our young nieces. She’s very sparkly and bubbly, so this fit her perfectly! That being said, I was reminded exactly why I hate using beads that need to be multiple stringed! 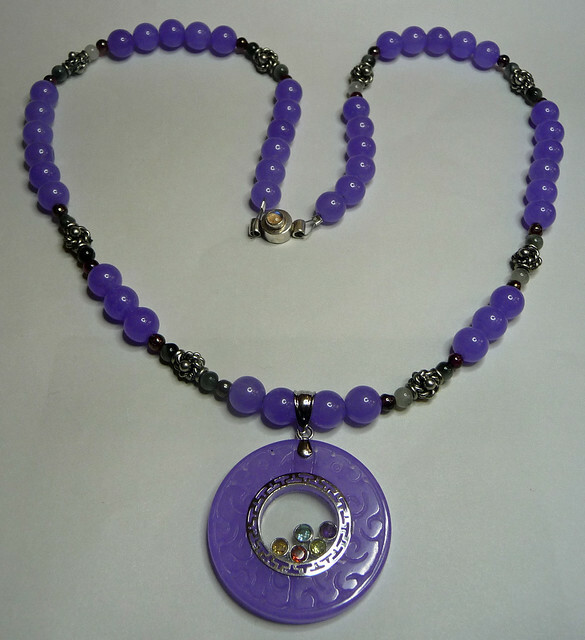 This brightly colored glass necklace is for our 2 year old niece. I wasn’t sure if her mom would put it on her, but one of our other nieces told me that she was wearing it and roaming the house soon after getting it. So I’ll call that a success! 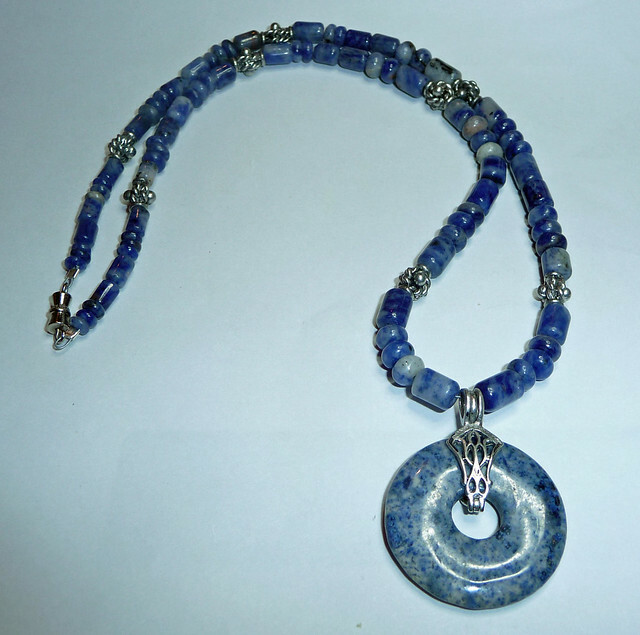 This blue African jasper and silver findings necklace (with matching blue African Jasper focal) ended up arriving the day before our niece was going to a dance. She made sure her outfit matched this when she went out the next night. 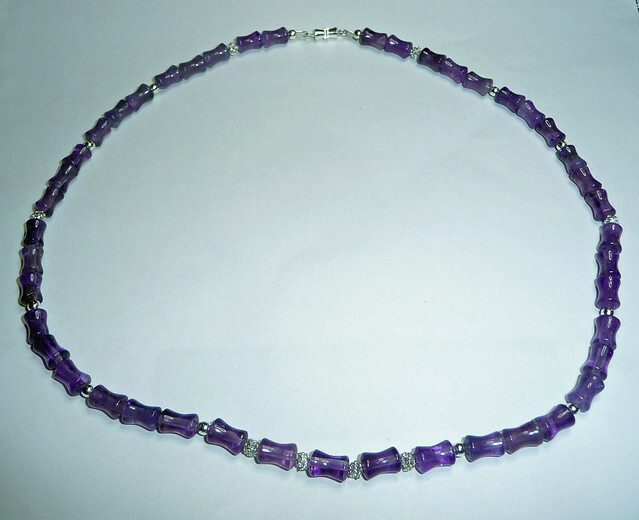 This is a fluorite and silver necklace for one of our nieces, with mixed shaped fluorite added in for accent. I put together the focal piece just for this necklace. 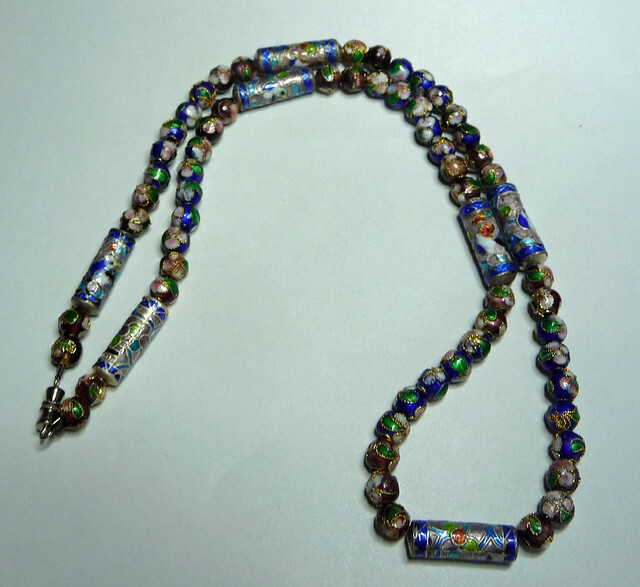 Blue glass beads from my great-aunt paired with gold findings for one of my SiL’s. This amethyst is cut in the “dog-bone” style. I paired it with two different types of silver findings for one of our nieces. 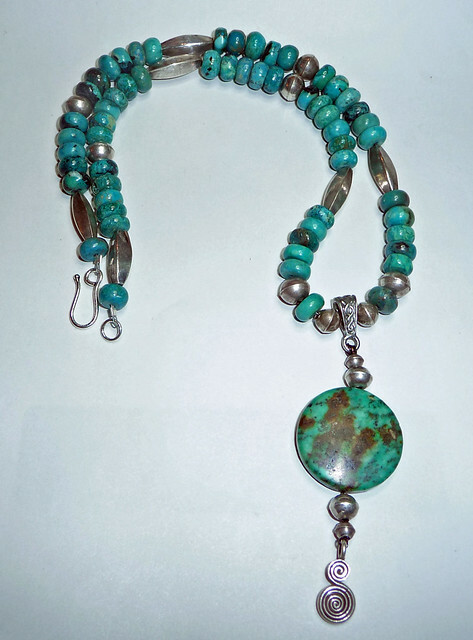 Turquoise and silver necklace for a SiL. 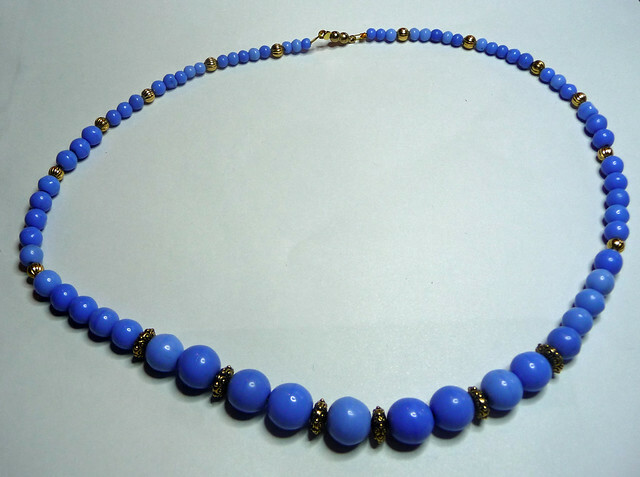 I put together the focal specifically for this necklace. A closeup of the turquoise focal. 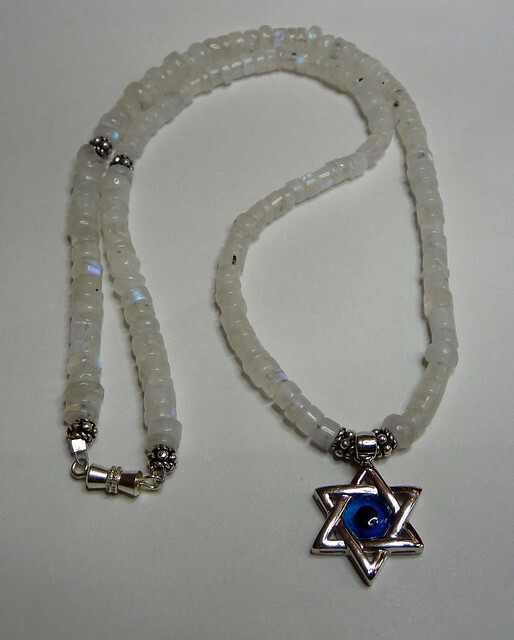 I saw this Eye of Fatima Star of David during our travels and I bought it for myself. I paired it with moonstone, and some minimal silver findings. 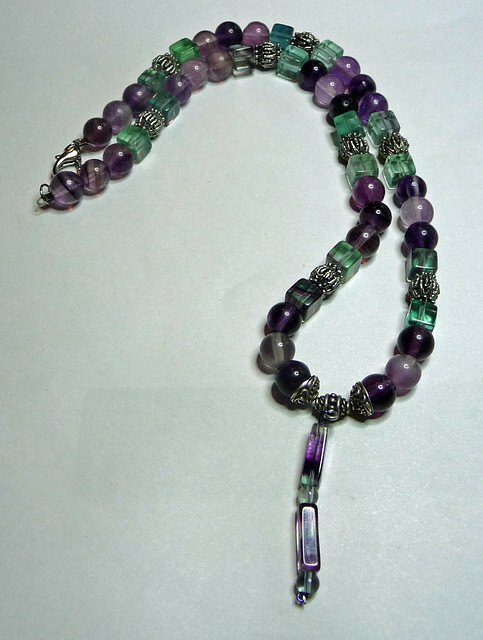 I made this purple jade and quartz necklace, with cats eye and garnet accents. The clasp is moonstone. I haven’t decided if I’m going to sell it or keep it. I have 3 other focals like this in different colors: red jade, black jade, green jade. 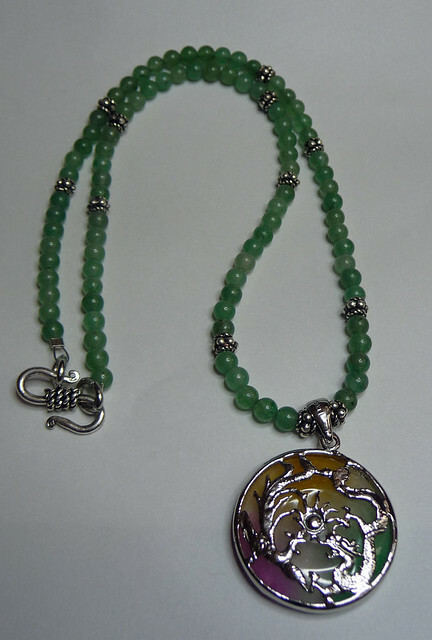 This is a green jade necklace with a dragon rainbow jade focal piece I picked up at the Jade Market in Hong Kong. I haven’t decided if it’s for sale or to keep. 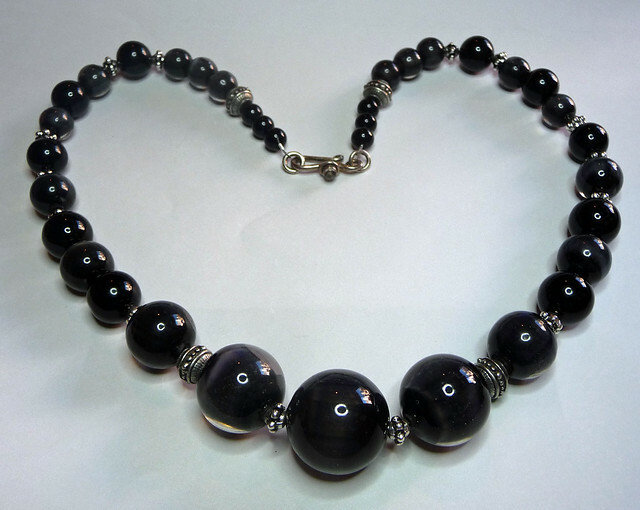 I had made this a necklace a long time ago, but it got too tight. It was in my “to redo” pile when a friend saw the beads and fell in love. So I made her a commission necklace instead. canyonwalker wanted some new tie tacks; here’s one I made for him. 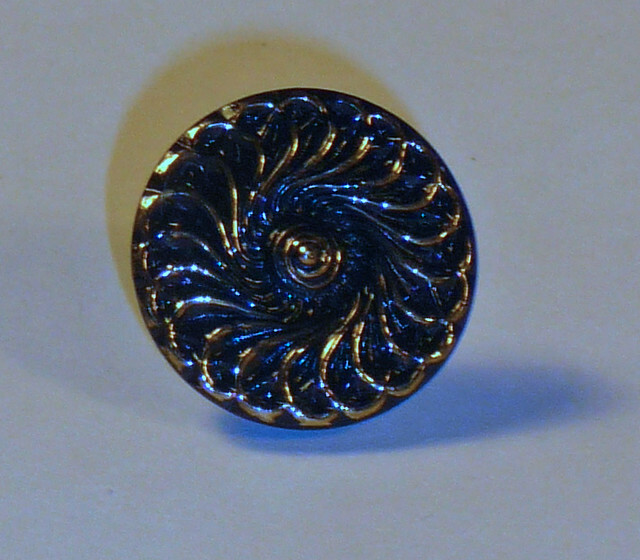 This is the other tie tack I made for canyonwalker. 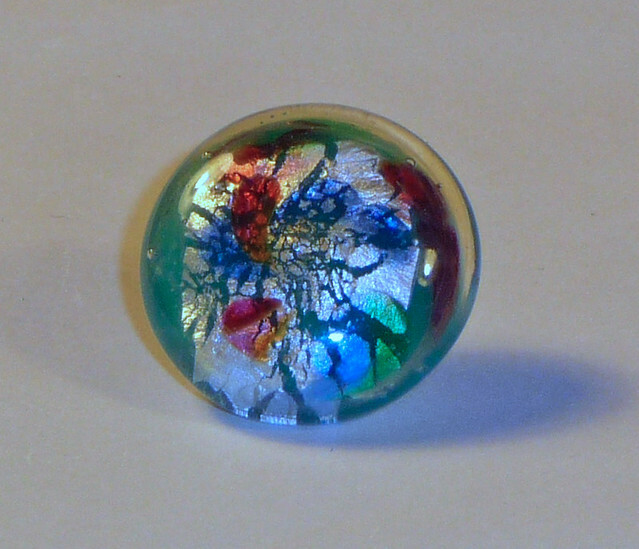 I had some extra tie tack backs, so I made this one out of an antique glass bead that was my great-aunt’s. NOT to canyonwalker’s taste, so it’s made for sale. 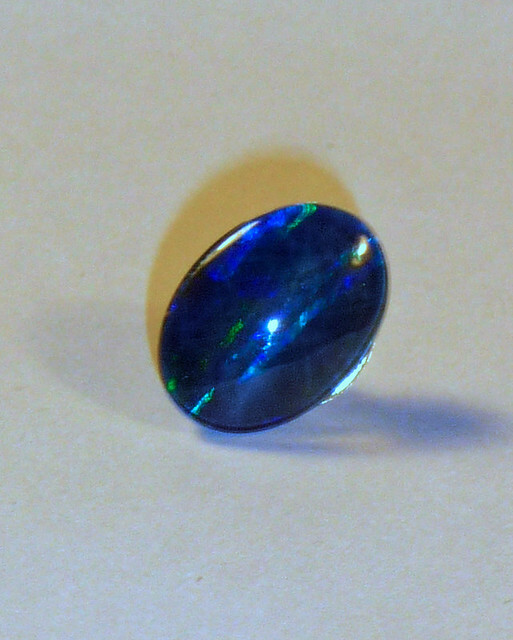 IIRC, this is Blue Opal. 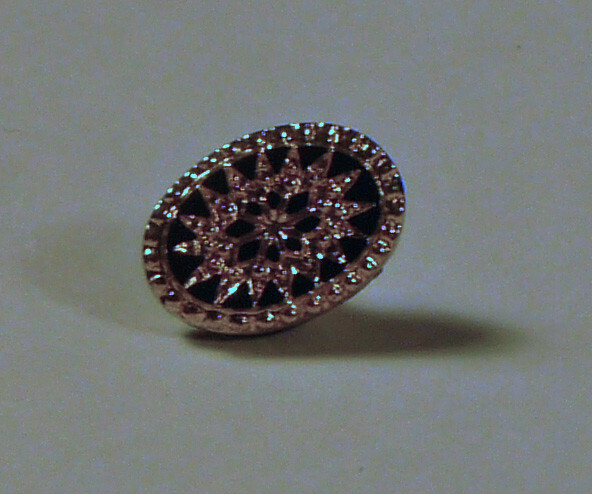 Another tie tack I made because I had extra backs. For sale. P.S. I'm close to dealing with the business license. Next week. This entry was originally posted at http://merhawk.dreamwidth.org/556335.html. Please comment there. If you don't currently have a DW account, you can use OpenID or create your own account for free.